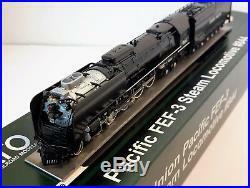 The Union Pacific FEF (F our E ight F our), along with the GS-4 is easily one of the most recognizable US steam prototypes still in operation today. 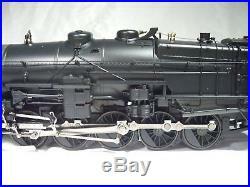 The FEF-3 series of steam locomotives was delivered in 1944 and were the last, and some of the largest, steam locomotives delivered for use by the Union Pacific. Today, FEF-3 #844 (at some times during history also known as #8444 to avoid numbering conflictions with a diesel loco) survives to pull excursion trains as a publicity locomotive for the Union Pacific, and is one the UP’s oldest operating locmotives. Accompanying the “living legend” FEF-3 is always at least one of a pair of Union Pacific Water Tenders, carrying spare water for the steam engine (Water filling stations being a rarity in the diesel era). These unique re-built cars have seen service as both Steam and Gas Turbine Electric fuel tenders before finally settling into their current forms as part of UP’s steam heritage fleet where they operate as separate (but always-present) cars. 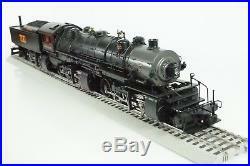 The Kato N Scale FEF-3 follows in the footsteps of its Southern Pacific 4-8-4 cousin. Refining the basic concept of a high-power, flexible steam locomotive which is easily upgradable to DCC by coupling a special, isolated coreless motor drive system with heavy duty flywheels and a flexible cross-braced suspension system that gives the locomotive a high torque, high traction grip that ensures constant and consistent pressure spread across the primary drivers. 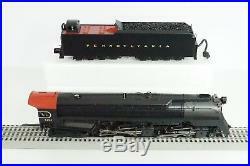 Another benefit of the coreless motor system is that the locomotive will have an extremely low starting voltage, giving the locomotive slow creeping speeds that will allow modelers to appreciate the complex arrangement of moving side rods that make steam operation so exciting. 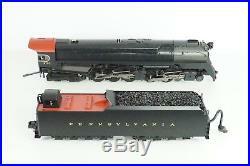 Other features, such as the locomotive’s unique “Centipede” style tender being fitted with special articulation mechanisms that appear seamless when observed but will bend and flex to allow the locomotive to navigate tighter corners than should otherwise be possible! New coreless motor design with dual brass flywheels for silky-smooth performance at all speeds, even slow crawls. 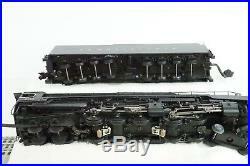 Special cross-braced shock absorbers equalize the pressure on the locomotive drivers to maximize traction. Illuminated headlight and locomotive numberboards. DCC friendly design, allowing for easy drop-in installation of DCC. 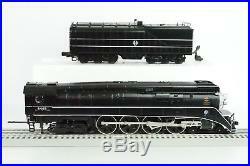 This locomotive is also available with DCC pre-installed from Kato USA! 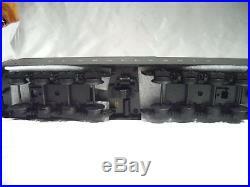 11″ (282mm) Minimum turning radius on ground level track, 15″ (381mm) Minimum turning radius on Viaduct track. All detail parts installed. 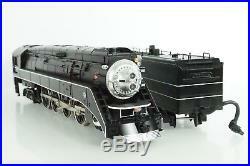 Excursion Version: White Driver rims, silver smokebox, gloss paint. 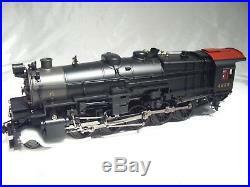 The item “N Scale KATO FEF-3 4-8-4’Union Pacific’ With Factory DCC Item #126-0401-DCC” is in sale since Monday, April 30, 2018. 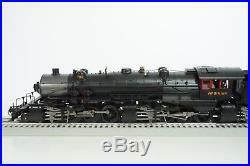 This item is in the category “Toys & Hobbies\Model Railroads & Trains\N Scale\Locomotives”. 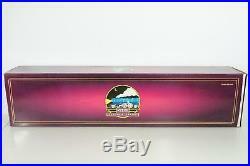 The seller is “prescotthobbies” and is located in Prescott, Arizona. This item can be shipped to United States, Canada, United Kingdom, Denmark, Romania, Slovakia, Bulgaria, Czech republic, Finland, Hungary, Latvia, Lithuania, Malta, Estonia, Australia, Greece, Portugal, Cyprus, Slovenia, Japan, China, Sweden, South Korea, Indonesia, Taiwan, South africa, Thailand, Belgium, France, Hong Kong, Ireland, Netherlands, Poland, Spain, Italy, Germany, Austria, Bahamas, Israel, Mexico, New Zealand, Philippines, Singapore, Switzerland, Norway, Saudi arabia, Ukraine, United arab emirates, Qatar, Kuwait, Bahrain, Croatia, Malaysia, Brazil, Chile, Colombia, Costa rica, Panama, Trinidad and tobago, Guatemala, Honduras, Jamaica, Viet nam, Uruguay, Iceland, Sri lanka, Luxembourg. 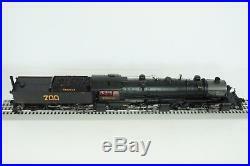 G SCALE USA TRAINS ITEM #R20001S. 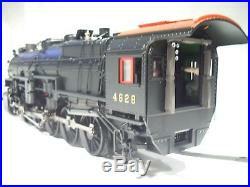 J1e HUDSON STEAM LOCOMOTIVE & TENDER – NEW YORK CENTRAL #5344 WITH SOUND! ONLY TAKEN OUT OF BOX ONCE TO TEST THE SOUND, THEN CAREFULLY REPACKED. A WOOD CRAFTMAN COULD EASILY REPAIR. LIST OF STANDARD FEATURES (FROM USA TRAINS WEBSITE). HIGHLY DETAILED DIE-CAST METAL CONSTRUCTION. 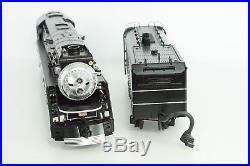 OPERATING HEADLIGHT & CAB LIGHT. OPERATING SMOKESTACK & BOOSTER EXHAUST STACK. ILLUMINATED MARKER LIGHTS. WORKING DROP COUPLER (FRONT). DIE-CAST SPOKED DRIVERS WITH STAINLESS STEEL RIMS. ROLLER BEARING DRIVE AXLES. STAINLESS STEEL DRIVE-RODS. DIE-CAST METAL SPRUNG BOOSTER TRUCK. 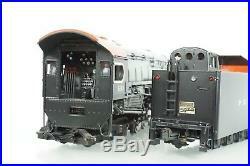 DRAWBAR COUPLING BETWEEN LOCO & TENDER. HIGHLY DETAILED METAL PIPING. SEPARATELY CAST METAL DETAIL PARTS. BRASS BELL & BRASS WHISTLE. DETAILED BUILDERS PLATE. WOODEN COLLECTORS BOX. 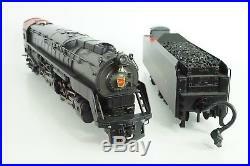 HIGHLY DETAILED DIE CAST METAL CONSTRUCTION. OPERATING BACK-UP LIGHT ON TENDER. DIE-CAST 6 WHEEL SPRUNG TRUCKS WITH SAFETY CHAINS. 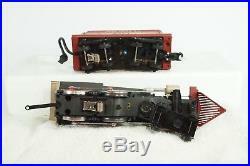 OPERATING COUPLER LIFT BAR. SEPARATELY CAST METAL PARTS INCLUDING WATER SCOUP AND BREAK CYLINDER. PHOENIX SOUND SYSTEM INSTALLED. 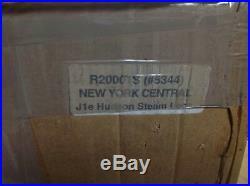 The item “KHS G SCALE USA TRAINS ITEM #R20001S J1e HUDSON STEAM LOCO NY CENTRAL #5344″ is in sale since Wednesday, January 30, 2019. 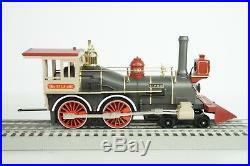 This item is in the category “Toys & Hobbies\Model Railroads & Trains\G Scale\Locomotives”. 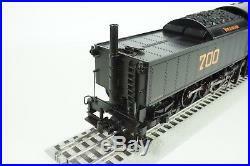 The seller is “march22″ and is located in Austin, Texas. This item can be shipped worldwide. 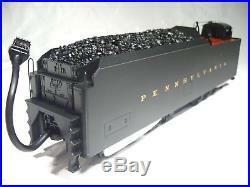 This is the O-Scale MTH Premier Pennsylvania 2-10-0 Decapod Steam Engine. It is item 20-3117-1. It does not appear that this engine was ever run. It looks to be new in the box. It has the following features. 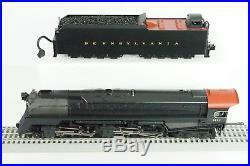 Die-cast Boikler and tender body. Metal Wheels and Axles. Precision Pittman flywheel equipped motor. Engineer and fireman figures. Metal Handrails and decorative bell. Sychronized puffing proto-smoke system. 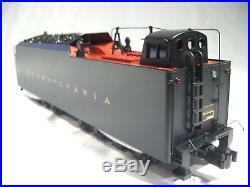 Operating tender back-up light. 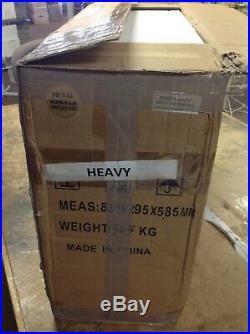 Unit measures 26″ x 2 1/5″ x 3 7/8. Operates on O-72 curves. 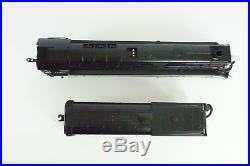 We have a large collection of O-scale 3 rail items with some accessories. We will be listing them for the next few weeks. If Local Pick-up is offered it will be from Chesapeake, Va. We really do appreciate your feedback and will leave it for you on the day it ships (normally). 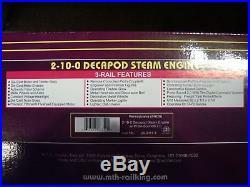 The item “O-Scale MTH Premier Pennsylvania 2-10-0 Decapod Steam Engine NIB Item 20-3117-1″ is in sale since Saturday, December 29, 2018. 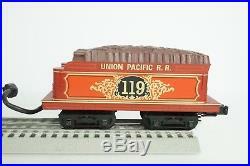 This item is in the category “Toys & Hobbies\Model Railroads & Trains\O Scale\Locomotives”. The seller is “et3″ and is located in Chesapeake, Virginia. This item can be shipped to United States, Canada, United Kingdom, Denmark, Romania, Slovakia, Bulgaria, Czech republic, Finland, Hungary, Latvia, Lithuania, Malta, Estonia, Australia, Greece, Portugal, Cyprus, Slovenia, Japan, Sweden, South Korea, Indonesia, Taiwan, South africa, Thailand, Belgium, France, Hong Kong, Ireland, Netherlands, Poland, Spain, Italy, Germany, Austria, Bahamas, Israel, Mexico, New Zealand, Singapore, Switzerland, Norway, Saudi arabia, Ukraine, United arab emirates, Qatar, Kuwait, Bahrain, Croatia, Malaysia, Brazil, Chile, Colombia, Costa rica, Panama, Trinidad and tobago, Guatemala, Honduras, Jamaica, Viet nam. 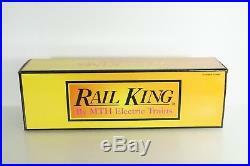 MTH RailKing Union Pacific. 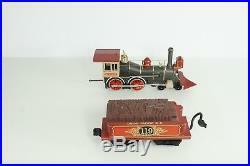 4-4-0 General Steam Engine and Tender. This General appears new to me. I programmed it into my remote and did a quick spin and it worked great, but the sounds were a little garbled. The system information states this engine has 0.7 scale miles on the odometer (I can supply a picture if interested) and the battery is low. 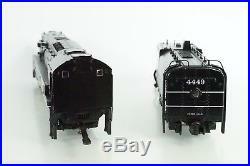 His is common for these older MTH engines when the battery levels are not maintained. As with every MTH engine, the battery needs to be fully charged for the engine to perform at it’s best. 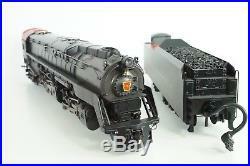 This is an awesome looking set and my favorite engine type. Some Features of this Item. Precision Flywheel Equipped Motor. All Metal Wheels, Gears and Chassis. Operates on O-31 Curves. (see picture of box end for full feature list). Manual Included in Box. The box has some shelf wear and looks nice. Let me know if you have any questions. 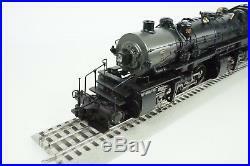 The item “MTH O Scale Union Pacific UP 4-4-0 General Steam Engine P2 Item 30-1229-1 NEW” is in sale since Monday, October 15, 2018. 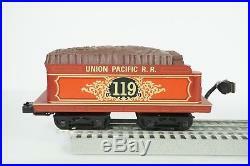 This item is in the category “Toys & Hobbies\Model Railroads & Trains\O Scale\Locomotives”. The seller is “mikesexpress” and is located in New Fairfield, Connecticut. This item can be shipped to United States, Canada, United Kingdom, Denmark, Romania, Slovakia, Bulgaria, Czech republic, Finland, Hungary, Latvia, Lithuania, Malta, Estonia, Australia, Greece, Portugal, Cyprus, Slovenia, Sweden, South africa, Belgium, France, Ireland, Netherlands, Poland, Spain, Italy, Germany, Austria, Mexico, New Zealand, Switzerland, Norway, Ukraine, Croatia, Brazil, Chile, Colombia, Costa rica, Panama, Trinidad and tobago, Guatemala, Honduras, Jamaica, Bahamas. 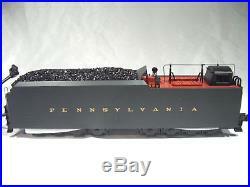 This is the O-Scale MTH Premier Pennsylvania 2-10-0 Decapod Steam Engine. It is item 20-3117-1. It does not appear that this engine was ever run. It looks to be new in the box. It has the following features. 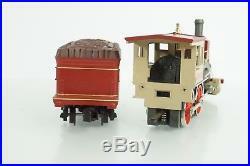 Die-cast Boikler and tender body. Metal Wheels and Axles. Precision Pittman flywheel equipped motor. Engineer and fireman figures. Metal Handrails and decorative bell. Sychronized puffing proto-smoke system. 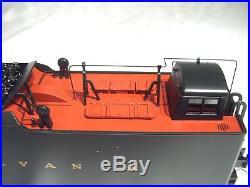 Operating tender back-up light. Unit measures 26″ x 2 1/5″ x 3 7/8. Operates on O-72 curves. 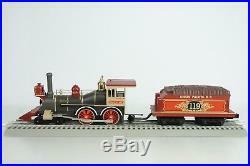 We have a large collection of O-scale 3 rail items with some accessories. We will be listing them for the next few weeks. If Local Pick-up is offered it will be from Chesapeake, Va. We really do appreciate your feedback and will leave it for you on the day it ships (normally). 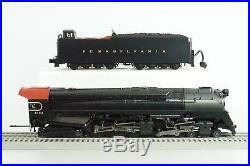 The item “O-Scale MTH Premier Pennsylvania 2-10-0 Decapod Steam Engine NIB Item 20-3117-1″ is in sale since Tuesday, November 27, 2018. 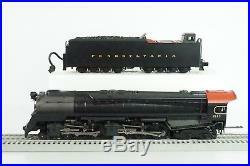 This item is in the category “Toys & Hobbies\Model Railroads & Trains\O Scale\Locomotives”. 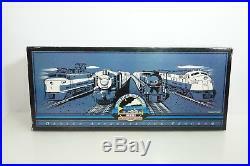 The seller is “et3″ and is located in Chesapeake, Virginia. This item can be shipped to United States, Canada, United Kingdom, Denmark, Romania, Slovakia, Bulgaria, Czech republic, Finland, Hungary, Latvia, Lithuania, Malta, Estonia, Australia, Greece, Portugal, Cyprus, Slovenia, Japan, Sweden, South Korea, Indonesia, Taiwan, South africa, Thailand, Belgium, France, Hong Kong, Ireland, Netherlands, Poland, Spain, Italy, Germany, Austria, Bahamas, Israel, Mexico, New Zealand, Singapore, Switzerland, Norway, Saudi arabia, Ukraine, United arab emirates, Qatar, Kuwait, Bahrain, Croatia, Malaysia, Brazil, Chile, Colombia, Costa rica, Panama, Trinidad and tobago, Guatemala, Honduras, Jamaica, Viet nam. 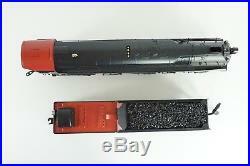 MTH Burlington Northern Santa Fe. 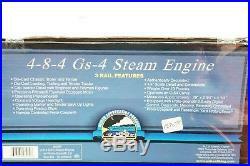 4-8-4 Gs-4 Steam Engine and Tender. This is a massive engine. 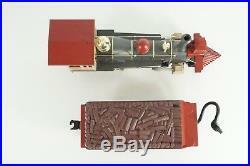 This engine has a two front lights, one that works with constant voltage and one the is a MARS (blinks) light. 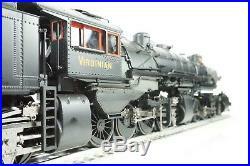 I don’t know that I have ever seen that feature on any other steam engine. Very neat looking on this massive engine. This engine just looks right to me. This set is new. I programmed it into my remote and did a quick spin and it worked great. The system information states this engine has 0.0 scale miles on the odometer (I can supply a picture if interested) and the battery is low. The sounds are a little garbled on this set. As with every MTH engine, the battery needs to be fully charged for the engine to perform at it’s best. 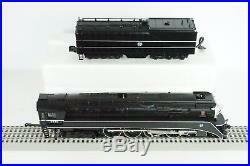 This is common for these older MTH engines when the battery levels are not maintained. This is an awesome looking, huge set. Some Features of this Item. Precision Flywheel Equipped Motor. All Metal Wheels, Gears and Chassis. 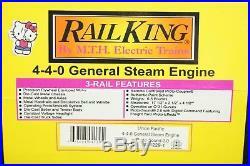 Operates on O-54 Curves. Proto 2.0 with Digital Command and Passenger Yard Effects. 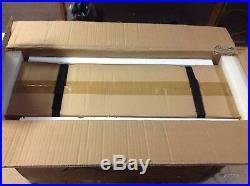 (see picture of box end for full feature list). Manual Included in Box. The box has some shelf wear with frayed and torn end flaps. 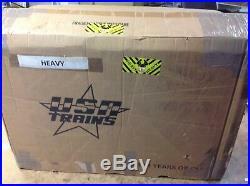 The seems have been taped on this box to properly secure the train. Let me know if you have any questions. 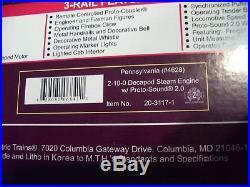 The item “MTH O Scale BNSF 4-8-4 Gs-4 Steam Engine and Tender P2 DAP Item # 20-80003A NEW” is in sale since Monday, October 15, 2018. 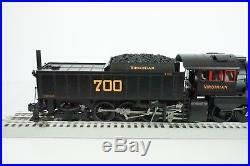 This item is in the category “Toys & Hobbies\Model Railroads & Trains\O Scale\Locomotives”. 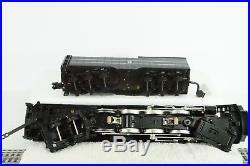 The seller is “mikesexpress” and is located in New Fairfield, Connecticut. This item can be shipped to United States, Canada, United Kingdom, Denmark, Romania, Slovakia, Bulgaria, Czech republic, Finland, Hungary, Latvia, Lithuania, Malta, Estonia, Australia, Greece, Portugal, Cyprus, Slovenia, Sweden, South africa, Belgium, France, Ireland, Netherlands, Poland, Spain, Italy, Germany, Austria, Mexico, New Zealand, Switzerland, Norway, Ukraine, Croatia, Brazil, Chile, Colombia, Costa rica, Panama, Trinidad and tobago, Guatemala, Honduras, Jamaica. 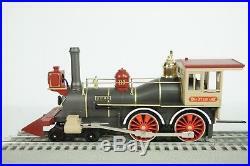 4-4-6-4 Steam Engine and Tender. 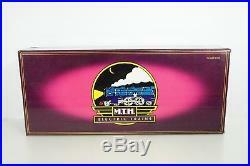 This is another massive MTH offering. This set is new. I programmed it into my remote and did a quick spin and it worked great and sounded awesome. The system information states this engine has 0.0 scale miles on the odometer (I can supply a picture if interested). 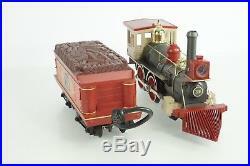 This may be the first steam engine set I have offered with a man sitting in the tender. As with every MTH engine, the battery needs to be fully charged for the engine to perform at it’s best. 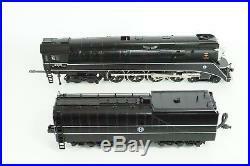 This is common for these older MTH engines when the battery levels are not maintained. This is an awesome looking, huge set. Some Features of this Item. Precision Flywheel Equipped Motor. All Metal Wheels, Gears and Chassis. Operates on O-72 Curves. (see picture of box end for full feature list). Manual Included in Box. The box has some shelf wear and creasing in the corner. Let me know if you have any questions. 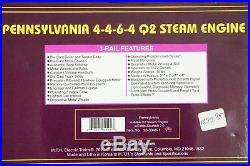 The item “MTH O Scale Pennsylvania PRR 4-4-6-4 Q2 Steam Engine with P2 Item # 20-3048-1 NEW” is in sale since Monday, October 15, 2018. 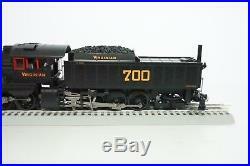 This item is in the category “Toys & Hobbies\Model Railroads & Trains\O Scale\Locomotives”. 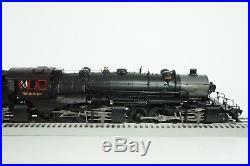 The seller is “mikesexpress” and is located in New Fairfield, Connecticut. This item can be shipped to United States, Canada, United Kingdom, Denmark, Romania, Slovakia, Bulgaria, Czech republic, Finland, Hungary, Latvia, Lithuania, Malta, Estonia, Australia, Greece, Portugal, Cyprus, Slovenia, Sweden, South africa, Belgium, France, Ireland, Netherlands, Poland, Spain, Italy, Germany, Austria, Mexico, New Zealand, Switzerland, Norway, Ukraine, Croatia, Brazil, Chile, Colombia, Costa rica, Panama, Trinidad and tobago, Guatemala, Honduras, Jamaica. This set looks fantastic and it’s nice and clean. I programmed it into my remote and did a quick spin and it worked great. 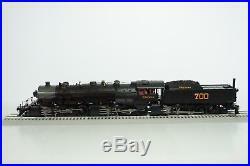 The system information states this engine has 20.4 scale miles on the odometer (I can supply a picture if interested). The set spent most of it’s life behind glass in a huge collection. The sounds are very loud and nice and clean. Some features of this set. Precision Flywheel Equipped Motor. All Metal Wheels, Gears and Chassis. Operates on O-72 Curves. (see picture of box end for full feature list). 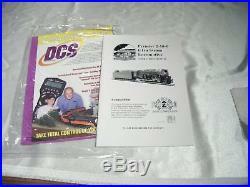 Manual Included in Box. The box has some shelf wear and creasing, especially on the end flaps. Let me know if you have any questions. 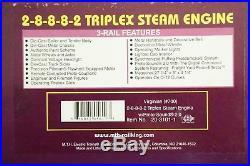 The item “MTH O Scale Virginian 2-8-8-8-2 Triplex Steam Engine with P2 Item 20-3101-1″ is in sale since Monday, October 15, 2018. 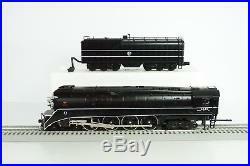 This item is in the category “Toys & Hobbies\Model Railroads & Trains\O Scale\Locomotives”. 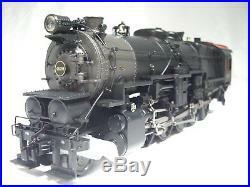 The seller is “mikesexpress” and is located in New Fairfield, Connecticut. This item can be shipped to United States, Canada, United Kingdom, Denmark, Romania, Slovakia, Bulgaria, Czech republic, Finland, Hungary, Latvia, Lithuania, Malta, Estonia, Australia, Greece, Portugal, Cyprus, Slovenia, Sweden, Belgium, France, Ireland, Netherlands, Poland, Spain, Italy, Germany, Austria, Mexico, New Zealand, Switzerland, Norway, Ukraine, Croatia, Chile, Colombia, Costa rica, Panama, Trinidad and tobago, Guatemala, Honduras, Jamaica.